The Adjusted Production Report displays daily adjusted production by provider for each procedure posted during the previous seven days. You can customize the default report as needed. Adjusted production for a procedure is the difference between the charge and the estimated write-off (the charge minus the contracted fee) and/or any applied credit adjustment. On the Power Reporting page, click (or tap) the Adjusted Production icon. Using the analysis report builder tools, set up filters as needed. Important: Do not edit the columns of the report. 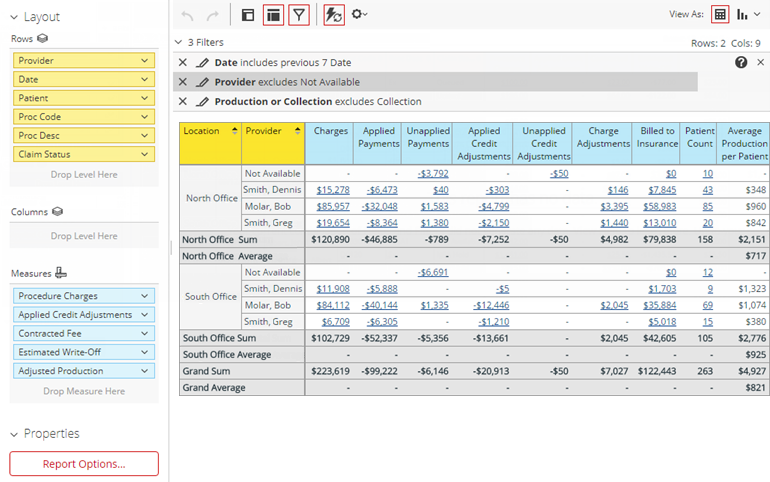 Adding or removing columns will change the base calculations and result in inaccurate reporting. However, you can filter any column as needed.